I truly believe that democracy is, in itself, its own fault. Firstly, look at America – every second idiot wants to be president and just about anybody can (Bush II for example – twice. What’s up with that?). 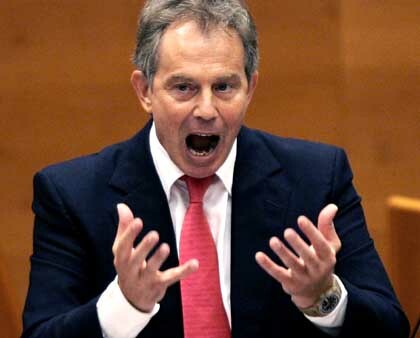 Look at the UK – if they can allow Tony Blair to run the show for a while, then why not Gaddafi? Yeehaaaaaa. Let the games begin. I won. I AM IN CHARGE!!!!!! YEEEEHAAAAA! And secondly, because too many stupid cooks spoil the broth. At the end of the day, every fool wants to be in power so that they can get what they want, their way. Which is basically the same as the idiot before them and the idiot to follow. Each fool just wants it their way. I mean, how many democrats does it take to screw in a lightbulb? Thirdly, democrats seem to have this innate need to go to war. See Afghanistan, Iraq, Vietnam. The list goes on and on. I don’t see Robert Mugabe invading Greece, or Fidel Castro marching on Rio, as it were. Hugo Chaves may have cancer (and a new hair cut), but that does not make him a war mongerer, does it? I advocate the end to bashing the Dictator by Western Democracies. Government is all about consistency. Rulers like us, at least, were built to last…. …until the next unrealistic dreamer with a machine gun mounted on the back of his Toyota Land Cruiser shows up at the Palace gates, that is. This entry was posted on Friday, August 5th, 2011 at 06:12 and is filed under Lessons in Dictatorship. You can follow any responses to this entry through the RSS 2.0 feed. You can leave a response, or trackback from your own site. See, now, that’s what I’m talkin ’bout (I think). Not everything is about the US. You misunderstood the use of the term “Democrat”… hold on, sorry, I just need to read the post again…ah yes. I am not referring to that Donkey Emblem Party (whats up with that? ), but rather to leaders of so-called democratic countries. That said, it is interesting that the US of A has instigated a number of wars. Thank you, Inspirator, for pointing that out.